The concept of “buy now, pay later” is a popular one here in the United Kingdom with a lot of big stores. And especially in this Christmas season with all the buying and buying everywhere, many are finding such offers too good to refuse. I believe it is the same in other countries and many big cities around the world as well. This arrangement is often associated with high value items. By it, you are able to walk into a store, buy the item you want even if you don’t have the money to pay immediately. With a simple agreement which you will sign, you are allowed to go home with the item provided your credit check as well as a few other inquiries are satisfactory. You will be required to pay for the item (interest free) on or before the expiration of a given period of time (for instance, it may be six, nine or twelve months, etc). This system has a lot of merits and in many ways, makes life easier. Last year for instance, I purchased an item under this arrangement and before the given time period expired, I called up the finance company and paid in full over the telephone. The whole thing felt so smooth and easy as I was allowed the needed time to manage my cash flow to accommodate the expense. As good as it sounds, it has an ugly side – that is where a buyer fails to pay up within the specified time. If that happens, the finance company (that underwrote the cost of the item you purchased) will immediately launch you into an instalment repayment plan spanning a number of years at the end of which you would have paid twice (and sometimes, three times) more than the original cost of the item. If you default with the instalment repayment, then the whole thing will compound and that is when you know you are really in a deep mess. Depending on the value of the item, it can launch a person into a cycle of indebtedness that is difficult to come out of. So if you are not sure of how to repay when the time comes, (or you know you don’t have the wherewithal to repay) don’t try this – you may be biting more than you can chew! A more painful scenario is where the repayment comes up after the benefits (or enjoyments) have ceased. It is like somebody taking a loan to sponsor an expensive holiday. By the time he begins to repay the loan, the holiday has come and gone. And all the fun he had (while on the holiday) is in past tense – the reality that he now faces is the pain of debt repayment which may last up to a year or more. And it is worse if he does not have the means to meet up with the monthly repayments of the debt. Each time I ponder the fact that a lot of people are living their lives the way they please without regards to where they are going to spend eternity when they leave this world, I can’t help feeling that they are doing “buy now, pay later” with their lives. Many are enjoying all sorts of sinful pleasures without regards to the consequences they would face later if they die in their sins. I know that saying things like this is no longer popular. In fact, it is considered an offence in many quarters including many churches (especially the “socially correct” ones). But bear with me because this is still the truth according to God’s word. Many people have persuaded themselves into believing that the Bible is not true and there will be no judgment after this life. Well, let’s not go into any debate over that now. My question is, SUPPOSING God is actually to judge sin one day…..! I said supposing – even if you don’t believe it, just suppose! SUPPOSING there’s going to be judgment for every act of ungodliness and sinful pleasures including sexual immorality and perversion, lying, cheating and stealing, blasphemy, hatred and murder, etc …. Yes, SUPPOSING that is going to be the case just like the Bible says, how well will you fare? That is to say, when the time comes to repay, can you really pay? And the truth is, no one is without sin – whatever that sin may be. According to God’s word, none of us has what it takes to pay for our sins. The wages of sin is death and we are all guilty! But God in His marvelous kindness and love sent His own Son, Jesus Christ to come down to this sinful world to die in our stead to take away our sin and the penalty we justly deserve. All that is left is for us to come to God with a repentant heart, believe in the price that God’s son (Jesus Christ) paid on our behalf, and ask to be forgiven and saved. God in His mercy has promised in His word that it doesn’t matter how sinful and guilty we have been, if we will do just that, He will accept us, forgive us of our sins and make us His own children. 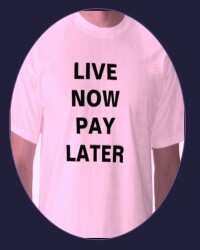 Or Would You Rather Pay It Later – Yourself? God’s free offer of salvation is only available while we are alive – it expires the moment a person dies. Those who reject this gracious offer will have no choice than to face up to the consequences of their own sins before a holy God and they will be required to pay the debt that they have no means or ability to pay. The result will be an unending (justly deserved) punishment in a place called hell fire. I know it doesn’t sound exciting and it is certainly not “socially” or “politically correct” but it is the truth of God’s word and no one ought to be ignorant of this truth and impending reality. Be Smart Dear Friend – Don’t Let It Happen To You! It is when faced with God’s judgment for a sinful life that many will come to realize that they did not get away with their careless godless living and all the sinful fun they had while on earth. And many have embraced it, rejecting the truth of God’s word and blatantly indulging in all manner of sinful living. Don’t do that with your eternal destiny. It is too expensive a proposition to allow. Accept God’s love for you today and be saved. For more information and help, click here. A lot of times, when people have suffered a serious tragedy or are facing severe hardships/difficulties, they often wish for death. And if they die in such a situation, it is common to hear their loved ones saying it was better for them to die than to have continued to live. Death is seen as a relief in such circumstances. In fact, this is the same kind of thinking that has led and still leads and tempts many people to deliberately take their own lives by committing suicide. Could they be making a serious mistake? Even though there is a verse of scripture (Ecclesiastes 7:1) that tends to subscribe to that philosophy, it is important that we know the sense in which it can be true that the day of one’s death is better than that of his birth and the sense in which it is not. Do I know why I am here or how I got here? A lot of people do not know the reason why man is on earth to begin with. The question of how we got here and what we are here for need to be answered to give meaning to our existence on earth. A person who lives through life without even knowing what being here is all about is like one who lived in the dark. Sad to say, that is the story of countless millions. Some think and actually teach that we just happened out of nowhere. According to some university intellectuals and their adherents, we are a product of a “big bang” brought about by the fusion of certain atoms sometime in the distant past. But they are yet to tell us who made those so called atoms (or maybe they just happened on their own too!). As ridiculous as that is, many still believe it! And thanks to Mr. Darwin and his proponents, we are a product of evolution. In fact, man’s great grandparents were apes. But one simple question they have not been able to answer is what stopped the process? Till this very day, birds are still hatching out birds after their kinds, goats are giving birth to goats, lions to lions, dogs continue to produce dogs, fish produce fish after their kinds in their numerous varieties and even apes themselves are still birthing apes. So if apes evolved into humans, what stopped the process? When last did anyone see an ape that evolved into a human being? Let’s stop fooling around with all these misleading and baseless theories and accept the plain truth that there is a God who made all things including man just like the Bible tells us. To my own mind, no one is supposed to live and die without knowing how he got here or who sent him here. How can the day of death be better than of birth when a person dies without finding an answer to the most basic question about his life on earth? Where am I going when I leave here? This is another basic question. If it was true that life ends in the grave, then in all situations and circumstances, death will be a relief, a way out of a life of troubles and problems. But that life does not end in the grave is a fact that cannot be contested beyond any reasonable doubt. If fact, there are more evidences (even scientific ones) that confirm that physical death is not the end of a man’s life. For instance, think of “near death experiences” (NDE). There are several real-life accounts of people who died, were confirmed dead by medical doctors but later came back to life to narrate what happened when they left their dead bodies. They found that they were alive somewhere else after death. Such experiences are not a product of mere psychological hallucinations or trauma as is often alleged by those who would prefer to brush them aside. Then think of Jesus Christ who was crucified, died and was buried but on the third day, He resurrected from the dead and forty days after, before the watching eyes of many people, He ascended alive into heaven (see Luke 23 and 24). And not only that, there are also numerous passages in the Holy Bible that explain that man’s life does not end in the grave – there is life after death. But here is a key point: We learn also from the scriptures that those who die do not all go to the same place. You either go to a place of pleasure and glory when you die or to a place of unending torment and gloom – it all depends on one crucial criterion – whether or not your soul is saved. Click here to find out how. For someone to die without knowing where he is going is like taking a leap into the dark. If an individual dies without being saved meaning that he is going to a place of unending torment after death, how can the day of death be better than that of birth for that individual? Death is not an escape route neither is it a relief from sufferings except your soul is saved through the saving knowledge of the Lord Jesus Christ. This statement may not be politically (or even religiously) correct but it is true according to the word of God. So dear friend, is your soul saved? Make sure it is before you leave here! Want to know how? Click here.